Having served as a top executive of the unionized labor of GM Daewoo, the predecessor of GM Korea, prior to entering politics, Hong is a well-known pro-union, pro-worker labor-rights advocate. At the National Assembly, Rep. Ha Tae-kyung of the Bareunmirae Party on Tuesday joined the fray by denouncing GM Korea’s union for its actions, and urged the government to drop its financial support for the carmaker. GM Korea has so far received half of the 810 billion won ($714.7 million) agreed in the April deal. The remarks from members of the National Assembly come amid increasingly complicated dynamics, with the KDB taking a step back from its push for a trilateral consultative body due to stark differences between the auto firm and the union. The KDB will instead carry out separate talks with each party, it said. 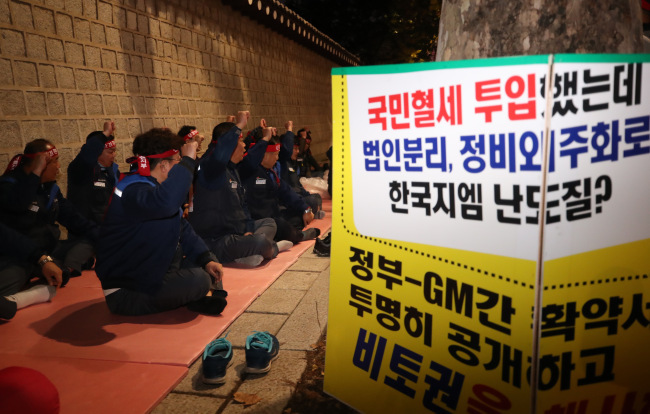 In response to the KDB’s earlier suggestion for a trilateral consultative body, GM Korea had asked for mutual consent first, while the union had demanded disclosure of the business normalization agreement signed between GM and the KDB. Separately, the union has also demanded that the KDB retract plans to transfer roughly 400 billion won out of the 810 billion won that the government agreed to provide to the carmaker in financial support in April. While trying to narrow differences with each party, the KDB said it will take legal action against the union for physically blocking three KDB representatives from attending the shareholders meeting where the vote on the spinoff took place last month, and against GM Korea for carrying out the spinoff without providing sufficient information.